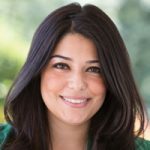 Ferial Govashiri had one of the world’s most fascinating and demanding jobs: gatekeeper to the Oval Office. As President Barack Obama’s personal aide and private secretary, she interfaced with national and global leaders, juggled crises and observed the most powerful office on earth from its most intimate vantage point. Today, she intertwines accounts of Oval Office events, such as a private meeting between the President and the Pope, with her own inspiring story as a child of immigrants seeking freedom and opportunity. Following her passions with confidence and conviction, Govashiri went on to challenge both convention and her parents’ expectations to pursue a career in the political limelight. Born in Iran, Govashiri immigrated to the United States with her family when she was six months old. Her father, who had been a respected physician, had to completely start over in his new country, imparting lessons of hard work, tenacity and overcoming challenges that forever shaped Govashiri’s work ethic and ambitions. She studied political science at UC-Irvine, working on local political campaigns and studying for the LSAT after graduation. Soon realizing that her heart was on the campaign trail and that law school was her parents’ dream, not her own, Govashiri gained their support to move to L.A. to work for The Strategy Group, a political consulting firm. In 2007, she joined the presidential campaign of then-Senator Barack Obama. President Obama’s election led to eight-plus years of progressively important roles, from working on the Obama-Biden transition team to senior advisor to the chief of the National Security Council and director of visits. In 2014, Govashiri was named personal aide to the President of the United States, one of the most coveted jobs in Washington. In this role, she perfected the art of leadership and grace under immense pressure as the literal gatekeeper of the Oval Office. Now working as chief of staff to the chief content officer at Netflix, Govashiri continues to run the show professionally while captivating audiences as a keynote speaker. Her presentations include inspiring tales of overcoming challenges, the value of diversity, leading with confidence, and the importance of trusting in yourself and your dreams.